Last week I introduced Simon Sinek’s golden circle – which shows that successful innovators start from a clear conviction or purpose that inspires belief and loyalty. The purpose of Food+Tech Connect is to connect innovators that are empowering better decision-making throughout the Food System. Moving out on Sinek’s Golden Circle the next question is HOW? At the base of this structure is Empowerment. Empowerment is the floor – or the first filter that frames strategy for Food+Tech Connect. Empowerment is crucial because it is a principle that addresses the major disconnects within the existing food system. The current system depends on blind loyalty, habit and convenience to drive decision-making. Elements of a reformed food system that provide access to information about food content, provenance, and growing or manufacturing conditions will lead to informed – and empowered — decision-making. The innovators, entrepreneurs and researchers who are breaking open this paradigm are the key community for Food Tech Connect. Industry practices that obfuscate, misinform and confuse decision-makers are its target. The second value is Mutual Benefit, again a core principle that relates to empowerment. As a business philosophy mutual benefit comes from a frame of abundance, rather than scarcity. An abundance framing of opportunity is based on a strategy of propagation that is most similar to milkweed: scatter many seeds to the wind to ensure that at least some of them thrive and continue the species. Through broadly sharing ideas, connections and information, Food+Tech Connect and its community of followers and users will all be enriched. This principle of mutual benefit is core to Danielle’s life operating principles. With Food+Tech Connect, her goal is not to just push content and ideas, but rather to create a community and a forum that addresses the needs of entrepreneurs, government officials, researchers, etc. For this to work, it will be crucial for her to be open herself, engage with readers to understand their needs, and design a platform that encourages and reinforces openness, exchange, and collaboration. Have you seen this principle at work in your life? In your business? The Food + Tech Hackathon earlier this month is a clear embodiment of this principle. Danielle issued an open invitation. Hackers, researchers, local food systems advocates, entrepreneurs and open government experts all came together and spent the day creating apps, building software, testing data and learning about research about building a semantic web. The sum of the efforts and connections that came from the hackathon reflect the value of mutual benefit. See list of hackathon projects here. 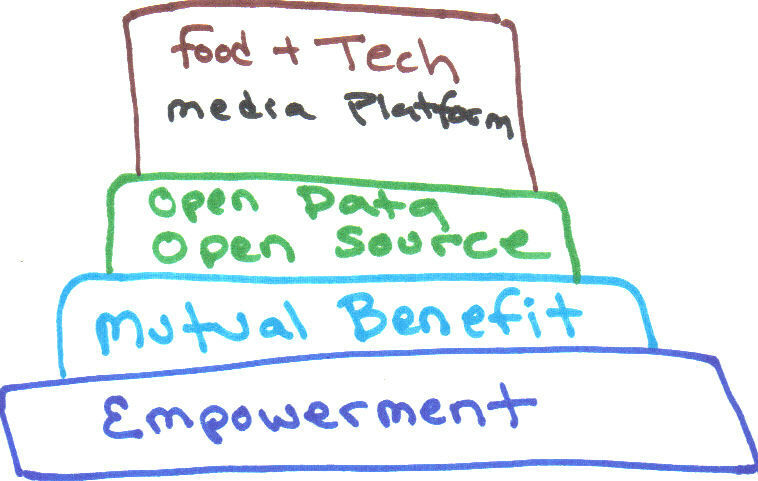 The third value in the Food+Tech Connect pyramid is Open Source/Open Data. This value is of course connected with both empowerment and mutual benefit. Open Data is a pre-requisite to both empowerment and mutual benefit for Food+Tech Connect and other technology innovators, especially in the food system. The Government’s open data initiatives are therefore key to both empowerment and mutual benefit. You could view the Open Data as the gateway that makes much of this innovation possible. However, without the empowerment and mutual benefit frames the impact would be much more constrained – focused on a single company, or one small part of the entire business ecosystem rather than stretching across the food system. What do you think of the Food + Tech values pyramid? Are there any other principles that should be included? How does this relate to YOUR business? Remember; this is your opportunity to enrich the debate with your comments. Christine Rico is the Founder and President of Waste to Wealth. Christine has more than 20 years experience with business planning, social venture business development and non-profit management. Christine has worked with organizations and companies in all stages: start-ups, turnarounds, rapid expansion/replication and executive transitions.